KUALA LUMPUR, 7 July 2014 – The National University of Malaysia (UKM) is to enhance and share its resources and knowledge in the arts and culture with The Academy of Arts and Cultural Heritage (ASWARA). A Memorandum of Understanding (MoU) has been signed between them enabling the sharing of their knowledge and resources in the arts and culture which will in the long run benefit national arts and culture. Vice Chancellor of UKM Prof Datuk Dr Noor Azlan Ghazali said that the cooperation will help UKM’s Cultural Centre improve and strengthen its role in providing education and research as well as artistic ventures in its campus and other activities pertaining to the arts and culture. The collaboration will benefit those involved in the arts and culture especially their students by enhancing their cultural and arts education. It enables UKM cultural artists to receive top-notch training in ASWARA to enhance their performance, professionalism and the handling of new artistic equipments as well as transferring artistic technologies. Prof Noor Azlan said ASWARA with its vast experience, skills as well as expertise and facilities in the field of arts and culture will benefit UKM students getting exposure in those areas. Tan Sri Dr Rais Yatim, the Malaysian Government Socio-Cultural Adviser, speaking to reporters after the ceremony praised the agreement which will enhance Malay studies in higher education. 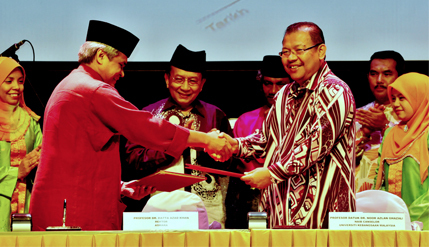 The MoU was held in conjunction with ASAWARA Jalinan Budi Ceremony 2014. Among those in attendance were The Rector of ASWARA Prof Dr Hatta Azad Khan; Deputy Vice Chancellor (Students and Alumni Affairs) of UKM Prof Datin Nor Aziah Mohd Awal; Registrar Puan Asmahan Musa; Head of UKM Cultural Centre Datuk Drs Rafae Mohamad and senior officials of ASWARA and UKM.